Many SW Florida residents will happily ring in the New Year and say good riddance to 2010. Others will wish it was Groundhog Day and would like to wake up to 2010 all over again. Your perspective today probably depends on where you sit on the housing fence, and what your expectations are for the New Year. So let’s set the table and give you some reasonable expectations of what to look forward to in the coming year. Experts disagree on where the market is headed nationwide. 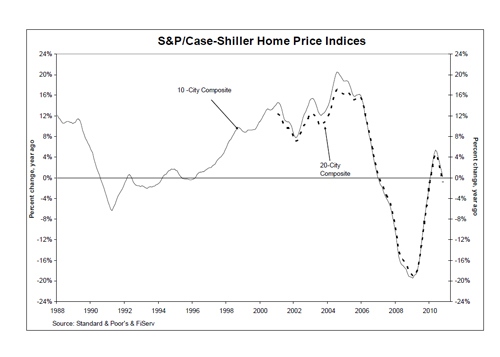 For instance, we noticed a recent Case Schiller national housing report that said October prices fell .8% year on year. Only Denver and Washington D.C. saw small price gains, and cities like Las Vegas fell 57.8% and Dallas 8.6% from their peak. Some cities have hit their lowest levels since 2006. Case Schiller and Standard and Poors only tracks 20 major markets. In their opinion, markets may not have bottomed, but they have stabilized. This study concentrated on the past. On the other hand, Fannie Mae believes the economic and housing outlook for 2011 is brighter. Falling unemployment claims and an uptick in consumer spending this holiday season are reasons cited in the December 2010 economic outlook. FNMA is a player because they insure many of the mortgages on the secondary market. This essentially creates the financing that fuels the real estate market and the economy, and FNMA plays a large role. For 2011 growth was upgraded to 3.4% from 2.9% due to changes in the economy. The report assumes an improving labor market, which we’ve long said is the key to any housing market recovery. Fannie Mae Chief Economist Doug Duncan was quoted as saying “Despite rising mortgage rates, our forecast for home sales is stronger than the previous forecast, given our brighter economic growth and labor market outlook. We expect modest increases in home sales, despite recent interest rate rises, due in part to modest additional declines in home prices, and we expect people to take advantage of affordability as their employment and income outlook brightens”. So two top forecasters are predicting declines in home prices nationwide in 2011, but what does that mean for SW Florida? Many believe SW Florida was the first to react and our prices have already fallen. Our prices have flattened and some believe we’re on the upswing. This could be true as foreclosures seem to be falling. We’ve cleared out seemingly all the investors from the 2004-2006 frenzy and now we’re dealing with foreclosures from regular folks who just can’t hold out any longer. If this is true, inventory could continue to lessen, and eventually we’ll see upward pricing pressure. SW Florida real estate prices are artificially too low and will at some point increase. The real question is when, and at what rate. If we’re setting realistic expectations, a full blown recovery could still be years away. If we’re looking at statistics, 2011 could be a better year for sellers price wise, but nothing that will be earth shattering. SW Florida is almost 100% dependant on investors, 2nd home buyers and the like until our job growth rises again. Construction is almost non-existent and isn’t coming back strong anytime soon. Until we get real investment and job growth going in SW Florida, there won’t be major upward pricing pressure. For the near term, our upward pricing pressure will be the sunshine and all the great things SW Florida has to offer. Our sunshine, beaches, and nature surely must look appealing to anyone stranded in an airport for 3 days, and each blizzard up North can’t but help make our outlook a little brighter. Florida took its lumps in 2010. We had an oil spill, high foreclosure rate, bumpy economy, and high unemployment. The oil spill is over and we came out largely unscathed, our foreclosures are declining, and the economy may have started improving nationwide. When this economy trickles down to SW Florida, all the pieces are in place for a brighter 2011. The investors may wake up and wish it was Groundhog Day so they can continue to buy at 2010 prices, but the rest of us will be glad 2010 in behind us and we can all start moving down that road of recovery and progress. Now if someone could just tell us definitely how long that road is, that would be nice. At least now the table is set, and maybe realistic expectations will be met. Posted in Southwest Florida Real Estate.Tagged Case Shiller Index, Fannie Mae.